This seems to be a real key focus of the preaching of Jesus (he spoke about that specifically during the forty days after His resurrection) and Paul (who seems to argue on that for 3 months) and I’m curious as to what it evokes in you when you read statements like those. Tom, There is a great book that was listed in “Christianity Today,” as one of the top 50 best evangelical books of the modern era. 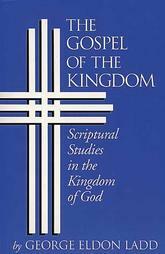 It is George E. Ladd’s, “The Gospel of the Kingdom: Popular Expositions on the Kingdom of God.” He also wrote another book that is currently out of print called, “Crucial Questions Concerning the Kingdom of God,” also, “The Presence of the Future.” He is ‘hands down’ my favorite on the subject. But you asked what the term means “to me”, and what it evokes in me, so I’ll say a little for myself on the subject. The kingdom cannot be bound to a time or a realm, though it has its operation in both. It is at once the present rule of God in terms of His sovereignty and providence over all things, and the divine conquest in subjugating all things to Himself. It is the saving action of God in both the present retrieving all that He has chosen (Eph 1:9) from the power and dominion of Satan. So the kingdom can also be defined in contrast to Satan’s kingdom. This is the eschatological dualism that gives the kingdom its future aspect, as realized now in part, more fully in the coming millennial age, and perfectly in the new heavens and earth. Whenever Satan is bound or routed by the action of the Spirit, there is the working of the kingdom of God. So the kingdom can be equated with the powerful working of the Holy Spirit. Before it is manifest in time and place, the kingdom is first a revelatory phenomenon. This recognition helps to make sense of many otherwise very difficult applications of the term, particularly by Jesus. When revelation and divinely quickened truth breaks in, there is kingdom authority and power. There is transformation and also subjugation of Satan’s territory and possessions. The kingdom is taken by force when the sincere quest for righteousness exceeds and outweighs all other competing concerns. This ‘pressing into the kingdom’ is the surest sign that the Spirit has come to awaken and quicken the benumbed senses of the natural man to stir him to urgency and from there to regeneration, which puts him into the kingdom. So the kingdom is also a realm that may be entered. We see Jesus charging the lawyers who had the keys of the kingdom (the responsibility to reveal) with the crime of “blocking” access to those who are trying to enter. Some were entering then, and some were refusing to enter. It was a realm that co-existed in time with the natural realm. The kingdom brings a different kind of righteousness, even the righteousness of God Himself, which is of a transcendent order that lies outside the realm of what man can attain (Isa 45:24; 51:6; 54:17; Jer 23:6; 32:40; Dan 9:24; Mt 5:20; 6:33; 11:11). The kingdom is working when God is working. It had come to them; yet it was still coming. It was present and active; it was making its presence felt, as its powers were being manifest, removing the cloak and shutting men up to the crisis of decision. It was at hand, not only in the sense of near, but as standing by, as knocking, requesting access and inviting entry. For Israel, a crisis moment of decision had arrived, as though the waters had been stirred through the revelation and power that was present and at work in Jesus. A watershed of ultimate division had appeared that would be ultimately determinative for life or death. Men’s relationship to the coming kingdom was being decided now by their response to its compelling presence in the works and words of Jesus. As I see it, before it is anything else, the kingdom is the powerful ‘in-breaking’ of the Spirit of revelation; it is the divine disclosure of mystery, or where truth is to some extent known already, it is the power of the Spirit to quicken that truth unto new creation. In that, whether present or future, the powers of the age to come become to some measure accessible even now through revelation, and can be received according to the measure of faith. Albeit, such present possibility is not only limited by human weakness and sin, but also and more ultimately by what it has pleased God for His purpose for that time. It is ultimate humanism to suppose that God is always doing the same thing, to the same degree, at all times, that the only thing in the way is human sin or indifference. Though always a factor, that is certainly not all there is to it. There are times and dispensations of requirement in God. There are sovereign moves of His Spirit, and there is a woe for failure to discern those divine initiatives, as there is grateful praise for the grace to recognize and not miss what God is doing. I was a bit surprised to see that you made little mention of Israel in your comments. I do want to follow your suggestion and add some important points about Israel in relationship to the kingdom. I tend to forget that for many, the future of the kingdom does not include its theocratic stage in fulfillment of all that God has promised Israel as a fully redeemed nation at the head of the nations, thus, the necessity for a millennial interim. You and I know how deep this issue is to God as intrinsic and inalienable to the everlasting covenant. So you’re right; it’s not like me to fail to emphasize that on every opportunity. As to my meaning on the point about humanism, I’ll try to clarify that some more too. I’m very glad you asked me about that. I simply meant the tendency to ignore that in many things, God is not waiting on man, but on His own timing. There are things that God does in some seasons that He does not do in others, and it is not always only because man won’t let Him do more (though that is sometimes the case too; see Isa Isa 48:18; Mt 23:37). But some things wait for His sovereign time and choosing, when He shall rise up (“in the day of His power”). I was thinking of the ways God has chosen to bring His reluctant people to points of great transition and revival by the circumstances and tribulations that He ordains to move them to the necessary place of obedience and faith (“another will gird you and take you where you would not have gone”). I was objecting to the view that man ties God’s hands, so that He is not able to bring things to their appointed goal, “at the appointed, or set time.” That’s why we have such concepts as ‘apocalyptic determinism’ and appointed seasons of special divine initiative that distinguishes one dispensation from another. Some speak as though they think of God as struggling in a kind of cosmic dualism that ties His hands, so that the best He can do is chip away at evil in hopes that with enough human cooperation, someday, He will someday prevail. I’ve also heard othodox Jews talk this way. While there is indeed a dualism between good and evil, God is absolutely sovereign in His wise management of the conflict, demonstrating His judgments and His salvation, as He instructs the angelic order through it. See what I mean? This entry was posted in Recommended Reading, The Kingdom. Bookmark the permalink.